You guys, it has been a long day of hair color around these parts. After reading all your responses to my Currently cry for help, I was determined to take on the DIY hair coloring again. The process actually started yesterday when I visited Sally's for my supplies and I left empty-handed because the girl there was less than helpful and friendly. Joel and I went to get haircuts today, and I talked to the super nice lady who cut his hair about color for some more guidance. LONG story short, I ended up using a color remover to strip my hair of the buildup of color, which has prevented the ends of my hair from taking on any new color... even when I've paid well over $100 for said color. It's currently 8:18 PM, and I still haven't seen the final product because I'm doing a coconut oil treatment to add back some of the moisture I removed today. I'm feeling confident, though. And I promise I'll keep you guys posted! 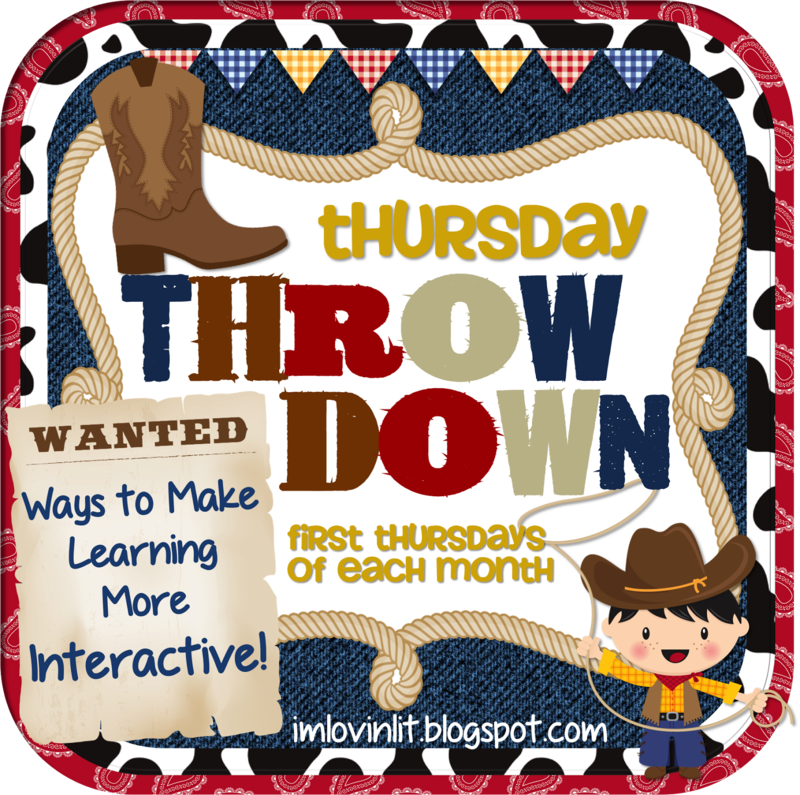 While I wait for my hair to soak up all the coconut goodness, I wanted to link up with my girl Erin at I'm Lovin' Lit for Thursday Throw Down. One of the things I've done to encourage students to be interactive with their learning is teach them about SMART goals. This was actually one of my professional goals one year, and I thought it would be a good way to give my students more ownership of their learning. So, the first thing we needed to do was break down what a SMART goal entails. I gave them this handy dandy worksheet, which you can download for FREE by clicking on the photo below. We worked our way through each step of a SMART goal citing examples and non-examples for each step, and then we practiced putting it all together. We started by writing personal goals for things they wanted to buy or get permission to do and created an action plan for how they could make that happen. Once I was sure all students understood the concept of a SMART goal, we wrote one for each unit. On the first day, I would give them a preview of what the unit would look like and tell them about the final assessment, which in my classroom was hardly ever a test because we focus on authentic assessments. Once they knew my expectations, students write a SMART goal that focuses on something they want to improve on for the unit. For example, during my poetry anthology unit (don't worry... this product is still coming), some of my students wanted to focus on mastering the use of literary devices. In order to get there, students knew they had to take good notes, write several examples, conference with a peer (or me) to make sure they were on the right track, etc. As it says in the handout, it's really important that students know themselves as learners in order to write a good SMART goal. During a reading-focused unit, for example, I saw action steps that acknowledged distractibility with a promise to not sit with a certain friend or to choose a spot away from the door. Other students, knowing they are the slower readers in their reading groups, vowed to bring their book home every night to catch up for the next day. 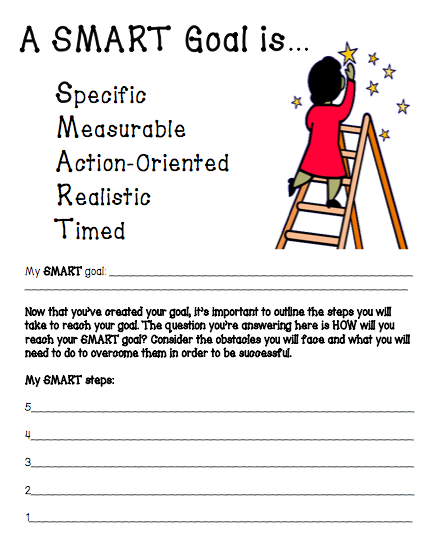 Our SMART goal worksheets served like contracts in our classroom. I approved each goal and the accompanying steps on that first day so I knew where each student was focused. It also helped me hold them accountable if their current behaviors were not going to get them to their goals. My favorite part about the SMART goals is that students are accountable to themselves. They're not doing something because I told them it was important but because it's a necessary step to help them reach their end goals. Hey girl! That worksheet looks awesome! I will be swiping that one up! I use coconut oil on my giant big head of hair everyday just to tame it down so I can fit it in to the car. I love it. Sorry about the bad coloring incident, had one of those myself a few years back:(. Hope it turns out like you want it!